Want to get life right? Bacon: News you can use! Time to get the 'ol Corvair out! The Master of the Moment - The F.B.I. 's reputation lies in tatters. The press lies, and shrieks, and clatters. And Trump just rides along and grins, Revealing all our betters' sins. H/T Anti-Strib and Cold Fusion Guy. The New York Times reports that a trend in foreclosure is for people to simply pay about $1000 to a company called "You Walk Away", stay there a few more months without paying, and then simply walk away to their next abode, perhaps even without a stain on the credit report. Now part of me wants to scream out something about Romans' admonition to "let no debt remain unpaid," and another part of me thinks "the guy's got a decent (but shameful) business proposition." Let me explain. What's likely going on is that an enterprising group of lawyers licensed in many states (California's bar exam is recognized a lot of places) have gotten together a set of form letters that they can slightly modify (or their paralegals or even office assistance can modify) to send out to banks to handle the foreclosure arrangements. OK, but why should someone pay for this? Well, most mortgages have provisions providing for remedy for the lendor to recover costs incurred due to foreclosure. Ordinarily, in a steady or rising market, that's taken care of by selling the home. In this market, they would most likely be taken care of via loss litigation. Homeowners generally don't do well in these actions, but "You Walk Away" does something very simple; they promise to fight the action tooth and nail. By concentrating on this small area of the law, they end up intimidating lenders into settling a foreclosure without recovering their costs. Delightful stuff. Now take a close look at his website, and read Matthew 28: 19 carefully. Many people talk a lot about making sure their churches are integrated, both racially and ethnically. Steve's walking the walk, and doesn't bother talking the talk. His technique, for what it's worth, is incredibly complex, and it reminds me of how a Confederate general worked to build a school for blacks in antebellum Virginia. Like Jackson, Steve gets out there and lets people know about a great opportunity. There are some things in life that bring tears to my eyes. Handel's Messiah. Getting married. The birth of my children. Ronald Reagan saying "tear down this wall". One more: Hayleigh Poutre is talking to investigators. Pray for this little girl, and put some Handel on the stereo. Shed a tear, and celebrate! You may, like me, have wondered "what do you get extra from buying bacon at $6/lb vs. bacon for $4/lb?" Of course, if you like your bacon to actually be smoked, do prepare to pay a bit more. If your taste buds don't inform you that spending a bit more on this ambrosia is a good deal, here's something more. I took 4 ozs of Mackenthun's applewood smoked bacon, and 4 ozs of "Farmland" mass produced bacon, and fried them. After frying, I weighed both sets of bacon. If you haven't heard, Ralph Nader is going to run for President again! This is possibly the best news the GOP has had in months, if not years. While I'm at some point sympathetic to Nader's thesis--that government deals too generously with corporations--at another level, I need to remember that his ideas (more socialism) aren't going to solve the problem. To draw a picture, the vitriol he leveled against the Corvair in 1965 was directed against a suspension that hadn't been produced since 1963. It wasn't him who improved car safety, it was GM, and even the pre-1964 Corvairs had a good safety record. What's unsafe at any speed? If you said "Ralph Nader," go to the head of the class. Or, rather, review of the 20 CDs of Vision Forum's "Best of the Entrepreneurial Bootcamp" set. A few years back, I (rightly or wrongly) perceived that Vison Forum was really strong on presenting Biblical masculinity in its ramifications for boys and men for the relationships with their families and the government, but seemed in some respects to neglect a man's position vis a vis his work, and the possibility or imperative of running his own business. In a nutshell; it's well worth the money. I appreciated especially the discussion of pitfalls into which entrepreneurs could fall--most notably loss of family time and the various debt/other instruments by which many entrepreneurs fall victim. Many of the speakers presented artfully the reality that their success was not just an artifact of chance, but that even many of the conditions under which they'd prospered occurred under God's leading. The concept of man taking dominion over Creation was a common, repeated, theme. My favorite speaker was Joel Salatin, operator of a very interesting farm in Virginia and advocate of a more "natural" method of farming. Check it out. Salatin more or less argues that modern farming is fighting with the created order, with the result that it's not only unprofitable (unless we're making our maize into corn likker for my truck), but it's also an environmental, family, and societal disaster. 1. The conference had a few spiritually young speakers. I don't think they went over any lines, but they would do well to explain (even more than they did) how their business views are different due to their conversions. 2. The speakers were generally those who had succeeded in putting bigger ventures together. A little more discussion on smaller ventures, or more speakers who had been successful in these, would be great. 3. A bit more about the Biblical instruction in this matter would be good. Is "buying your freedom" that Paul speaks of equivalent to "start your own business" today? 4. A bit more variety in businesses presented would be good. Hopefully Vision Forum or others will start filling this in. All in all, it's a great start, and I pray that it doesn't end as just a start. Lots of press lately about the proposed merger. Here in the Great White North, lawmakers and the governor are more or less quietly waving the sword of the state's $445 million bribe (oops, loan) to Northwest in an effort to "guide" the merger activities. People are justifiably worried about thousands of jobs and flights. Now I'd agree that losing thousands of jobs would be painful for the state, but I'd have to argue that it could be one of the best things that could happen. For starters, when Delta execs tell people that our jobs were lost in part due to our tax structure, maybe, just maybe, liberal high tax politicians would take notice and stop clamoring to raise taxes. Going further, if Northwest abandoned the routes it bought with our tax dollars, other carriers would step in to operate them more profitably. Southwest and others have wanted to do this for a while. Third, ending the disastrous experiment of funding Northwest with tax dollars would force airport authorities to concentrate on our state's real advantage; we're at sea level, and fairly far north. If you want a good starting point for a great circle route from most of the country to Europe or Asia, we are it. Fully loaded 747s can take off here (they can't at altitude, as in Denver), and it's not as far to go here than it is to fly to many other international airports. Finally, if they were forced by contract to pay back that $445 million, they'd reduce the perceived "need" to raise taxes. Maybe we could built a few roads and bridges with that money. Even bike paths are a better deal than bribing Northwest to stay here. Those who know me well know that I don't have a whole lot nice to say about Los Angeles, which I "affectionately" call "Los Diablos" for reasons related to its culture (or lack thereof), its smog, and so on. However, fair is fair, and I have to give credit to Los Angelinos for inventing a glorious food; the bacon wrapped hot dog, grilled and served with your choice of toppings, ranging from ketchup & mustard to green chile. I think I'll make some for my family tonight. And sad to say, government types have decided that grilling hot dogs instead of boiling them is a health hazard. Sigh. You'll have to make them at home, friends. ...masquerading as "sustainable architecture" is this, a $22 billion project in Dubai that will house 50,000 residents. Now do the math; $22 billion divided by a likely 15,000 residences is a cool $1.5 million per residence, which suggests that an amazing amount of effort (and carbon emissions) is going to be used to create this. Whatever it is, "carbon neutral" it ain't. Now read further. It's going to "draw on the traditional architecture" of the Middle East--meaning that for a mere million plus per household, these people are going to have homes much like those that their poor great-grandparents had. And environmentalists wonder why their ideas aren't exactly catching on among those of us who live on a budget. 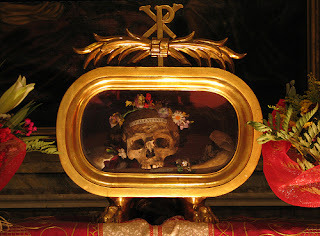 I never thought I'd be able to outdo my "Al Capone" Valentine's Day cards I handed out in college, but thanks to Gene Veith, I realize that this relic (said to be the skull of the original St. Valentine) achieves just that. Evidently, John McCain's camp is "suggesting" that Mike Huckabee stop competing for the GOP presidential nomination, claiming that he's "mathematically eliminated." Methinks McCain needs some math lessons, as he does not have 1191 delegates yet. Sorry, John. You get the pennant when your magic number is zero, not when it's likely that your magic number will get to zero. Just ask the 1969 Cubs; sometimes the fat lady sings in Gotham instead of Wrigleyville, and it's possible that she'll go visit Arkansas instead of Arizona as well. Not terribly likely, I'll admit, but it's possible. Just ask some people here. Arithmetic. It's part of the Quadrivium. Why not make it part of government? Truck, firearms, and power tools. I have a good wife. ...and one way NOT to. First, the good side. Jeffrey Tucker of the Mises Institute in an oldie but goodie; How to Dress Like a Man. Those among us who have walked around the South Pole in shorts may not like the advice, but for the rest of us, it's a darned good idea. Does your wife really deserve to be married to a bum? Here are some other ideas from Mr. Tucker on how to improve your domestic life, from turning your water heater up, to manners, to ending your use of shaving cream. Try some, try all, and make your spouse a happier lady. Next, what not to do; don't pay attention to those who would convert romance into prose from the poetry that it is--those who would change the waltz of love into a mosh pit. You know the type; those who (like Cosmo) would boil it down to new positions and techniques (creating a ton of business for chiropractors, I'd guess), those who would make their first great love into a Ph.D. thesis (I am sadly not making this up), and those who would reduce it to gadgets, scents, and impressive "dates." Remember; Anne Bradstreet didn't have all these things, and she wrote this. We do have these "romantic charlatans," and we've got a 50% divorce rate. Do the math, and learn some poetry. ...was made after a long time in thinking about the issues. On one side, I liked Ron Paul's principled "Dr. No" conservatism, but was taken aback at his failure to seriously realize that the struggle against radical Islam is not a new phenomenon; it dates back 1400 years to the time of Mohammed. McCain was never a real choice (though I'd certainly support him over Hillebeast or Obama) due to his authority of the McCain-Lenin-Feingold Campaign Finance Deform law--never mind his collaboration to prevent conservative jurists from getting to the bench and his support of stem cell research. Even Mike Huckabee was problematic; I love his support of a consumption based tax because it creates far better incentives than the income tax, but his support of a workplace smoking ban troubled me. Even so, he "gets" the current international situation in a way that none of his competitors do. Then, Rev. Huckabee sealed the deal for me by admitting that he's fried a squirrel in a popcorn popper, and for admitting that it really doesn't taste like chicken. Let's face facts, folks; if he can admit this, what chance does anyone in the world have of blackmailing him? Plus, he's dealt with one of the worst terroristic threats known to man; that is, Jihadi Squirrels. Vote Huckabee. Let's put Brunswick Stew in every pot! From time to time, many companies engage in "stock buybacks" in order to increase the value of their stock, and I got to thinking about this practice yesterday. More or less, you take money in quarter 1, buy back the stock, and then the money you spent in quarter 1 gets taken off profits in quarter 2. You reduce the number of shares and increase the profit/share in quarter 1, but then take the expense later, decreasing your profit/share at that time. Of course, you ignore that expense in your pro forma accounting sheets, falsely telling investors that your P/E is actually quite healthy. One wonders how many other activities of corporate finance offices are shell games, and how much more prosperous we might be if we didn't play them. Many people today will tell you that "Six Sigma" and associated programs are the cat's meow in product quality. While I can use the tools well, I've got my doubts, as I'm using things my grandfather purchased, but throwing away quite a few things I purchased for myself. Seems to me that our grandfathers knew a bit about quality and reliability that we've forgotten today. Perhaps a couple of stories might make clear what's going on. First, the standard example of Six Sigma quality is the failure rate airlines have of getting you off the plane alive; about four per million, or 4.5 Sigma. Our grandfathers would have hesitated at such a bait & switch, don't you think? Something about the 9th Commandment being the real start to quality? Next, a wonderful quality success story told me had to do with an eight factor (variable) designed experiment done to figure out what caused high failure rates in transmission chains. After a lot of wonderful quality work, they found out what any competent machinist could have told them; they were using the assembly tools long after they were worn out. In other words, they ended up fixing a problem they'd likely caused by extending the replacement intervals to save money, and at a massive cost to the company. Somehow (9th Commandment again? ), my instructor didn't see fit to share that side of the story. Don't get me wrong; statistical methods have a lot to offer. However, my experience is that too often, they're used to replace the expertise of craftsmen and high quality materials with unskilled labor and plastics. If you wonder why you're making good use of a lot of product warranties, you might find that your difficulties ironically have a lot to do with the manufacturer's quality program. KingDavid tells me about it; there is an ongoing tragedy where our neighbors to the north in Canada are losing their precious beer because it's freezing when they set it outside in the snow when it's 20 below. In response, the Great Western Brewing Company is sponsoring a contest to see who can model the conditions under which beer (or pop for that matter) freezes. So we're expecting drunks to figure out how to use a complicated thermal model and apply it to save their beer? Say what? Looks like these guys could make it in Parliament with logic like that. I bet there's a few cases in the snow outside their chambers in Ottawa. At any rate, here's the solution. Beer doesn't "age." It goes stale. So if you've got a full fridge and a few cases outside, you're either drinking stale beer, or you're a drunk, or both. Cut down on the stash and learn to enjoy what you have responsibly. Kudos to KingDavid for showing us a great example of trying to use technology to solve a problem that's really rooted in behavior. I'll let you know if I win, and if I do, you can have it all. I'm a teetotaler. Apparently, the Chinese company that makes the prenatal infanticide drug RU-486 has also poisoned its leukemia drugs, paralyzing thousands of patients. Sad to say, the same FDA that didn't think four transfusions in RU-486 clinical trials were worth noting also doesn't think that the company's quality record is worth reviewing. This is appalling; the ugly truth is that quality problems generally don't start on the shop floor, but in the corner offices, as men bucking for a promotion cut corners to get that last farthing out of the bill of materials. The FDA would do well, I think, to make sure they hire people out of industry who have learned this. Just say no to cannibalism!